The future climate Engineering Solutions has been running for almost 10 years bringing the skills of engineers to the climate conversation. COP23 being the cost time the countries meet to look at progress against their own self determined contributions should be full of engineers looking at the results, explaining the gaps and offering solutions to close and learning from those that exceeded. Find out details in this wonderful and interesting presentation at COP23 by the Future Climate Engineering Solutions. On Wednesday 8 November 2017 the Institution of Chemical Engineers (IChemE) Energy Centre, in collaboration with the Future Climate – Engineering Solutions (FC-ES) network, hosted a UK government pavilion event at the COP23 UN Climate Change Conference in Bonn, Germany. As nations look for opportunities to deliver and accelerate commitments to the historic Paris Climate Change Agreement at COP23, the discussions offered a timely reminder of the importance of industry and government collaboration in developing achievable emissions reduction strategies. Speakers from a range of engineering sectors discussed evidence-based solutions for putting climate policies into action, calling for a deeper partnership between governments and engineers to develop effective implementation strategies. Opening discussions, FC-ES steering group member Beatriz Fernandez presented the findings of the network’s National Energy Planning Good Practice Framework. The Framework brings together insights from developers of national energy plans across the globe to understand the key features of an effective plan. Reflecting on the project, Ms. Fernandez emphasised the need for early stakeholder engagement and equal consideration of factors such as affordability, security and sustainability. Andy Webster, Co-Chair of the Future Climate – Engineering Solutions network and a Fellow of the IMechE, outlined the UK Department for Business of Energy and Industrial Strategy’s Global Calculator project, discussing its use by government, NGOs and the public to explore the relationship lifestyle choices, the energy system and climate impacts. “The most important thing is understanding the boundaries we as nations face, and the need for a mix of solutions to achieve decarbonisation. The Global Calculator shifts thinking around energy and climate towards evidence-based solutions, and discussing these solutions with the public and other stakeholders is vital. The calculator introduces them in an accessible way, based on principles of openness, collaboration and simplicity. Chair of the IChemE Energy Centre, Stefaan Simons, said: “The considerable challenge of meeting emissions reduction targets cannot happen without a deep collaboration between industry and policy makers. The IChemE Energy Centre’s involvement the Future Climate – Engineering Solutions is a great example of what the engineering profession can bring to this partnership. Future Climate – Engineering Solutions (FC-ES) is a global alliance of national engineering institutions working to develop and share good practice in national energy and climate planning, with the objective to reduce greenhouse gas emissions and dependence on fossil energy. The alliance provides policy makers and industry with engineering solutions and insights to support the global 2030 Sustainable Development Agenda. We will be attending the United Nations Climate Change Conference in Bonn, Germany this year to discuss good practice in National Energy and Climate Planning as part of the UK Government COP23 pavilion. Future Climate – Engineering Solutions (FC-ES) is a global alliance of national engineering institutions working to develop and share good practice in national energy and climate planning. In this event members of the FC-ES network will present tools and guidance for developing effective emissions reduction strategies, focusing on the use of science-based engineering solutions to the challenge of delivering Nationally Determined Contributions (NDCs). FC-ES representatives will present the fourth iteration of the group’s National Energy Planning Good Practice Framework and reflect on the key features of effective national climate and energy plans from across the globe. Speakers will also discuss systems thinking approaches to balancing sustainability and security across the water, food, and energy nexus and the UK Department for Business Energy and Industrial Strategy’s Global Calculator project, considering the international context of implementing NDCs. Whilst no booking is required for this event, spaces are limited and can be reserved by contacting energy@icheme.org prior to the event. Please note attendance is open to Bonn Zone pass-holders only. Baroness Brown of Cambridge (a cross bench peer in the House of Lords and the Chair of the Adaptation Sub-committee of the Committee on Climate Change) explains the impacts of climate change (for example on national food supply) and talks about how engineers can help implement adaption strategies for the problems that will arise from climate change. 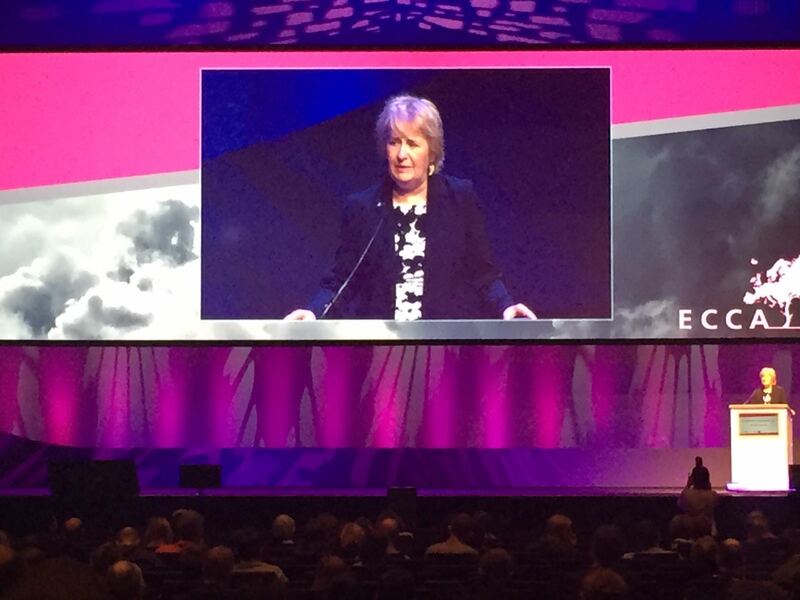 Roseanna Cunningham stresses that Glasgow was at the heart of the industrial revolution with it’s emphasis on the ship building industry and transatlantic trade. She asserts that it will continue to be an agent for change in the transformation of the new green economy as a response to challenges that are arising from climate change. Liz Bowles explains it is more complicated than that, she says “the consumption of white meat has quadrupled over the last 40 years.” This leads to a need for greater cereal production. Dr Alison Cooke (C.Eng.) asks Joel his opinion on the role that engineers play in implementing the climate change solutions needed facing the changes of the future, and the importance of climate change to the youth of Scotland. Dr Alison Cooke (C.Eng.) asking Duncan (Chief Resilience Officer for Glasgow) on how Glasgow has been adapting to the changing climate and what role engineers have played in coming up with and implementing solutions to the climate change issue.